I’ve been going over in my head the ways in which the Justice League movie failed. From the problems it inherited from Batman v Superman (namely: Batman and Superman’s characterization) to the fact that it had to introduce a bunch of new superheroes and get us to care about them at the same time as a generic alien invasion plot happens to the fact that the bad guy is just...uninspired. And since Justice League failed so much financially, it’s probably going to be a while until we get a sequel. Which is a shame, since I think a sequel could really only improve things — and, in fact, I came across an idea for a sequel that would avoid the same pitfalls of the first film and still be an epic adventure film. I called it, of course, Justice League Unlimited. Two Thanagarian officers, Katar Hol and Shayera Thal, escape their planet in their ship, the Kalmoran. They are running from something called “the Star Conqueror,” which took over their entire planet and is now moving on towards other planets. Katar managed to get the coordinates of the next planet in order to warn them, but was critically wounded in the process. He gives the coordinates to Shayera and asks that she warn them before he dies. She turns the ship towards the Star Conqueror’s next planet: Earth. In Detroit, a pitched battle between the Justice League (Superman, Batman, Wonder Woman, the Flash, Aquaman, and Cyborg) and the Legion of Doom (Lex Luthor, Deathstroke, the Cheetah, Captain Cold, Black Manta, and Grid) is interrupted by the arrival of the Justice League’s newest recruit: Green Lantern John Stewart. With Stewart’s help, the Justice League manages to capture every single one of the Legion and imprison them in a super-correctional facility called “the Slab.” Just as the League meet to thank John, however, they get word that a spaceship is about to crash into Midway City. Stopping the ship from destroying both itself and the city, John and the others are surprised when a winged woman emerges from the ship and tells them that their world is doomed. The League ends up fighting a crazed Hawkgirl, but exhaustion finally sets in and she falls unconscious. When she wakes up, she explains that one of the oldest and most dangerous creatures in the universe has awoken and started taking over everything in its path: the Star Conqueror, a giant telepathic being that spreads across the universe via spores. The spores attach themselves to people and control entire populations. John Stewart sends out a message on his ring to the Green Lantern Corps, but they say that all Lanterns are preoccupied with stopping the “Thanagarian outbreak” and there is no one to send to Earth. Batman learns that there are five objects already heading towards Earth — these are the “Seeds of Life,” each one containing millions of spores. Hawkgirl warns them that if they land on Earth, it’s already too late — they will spread and spread until they take over the entire population. The Justice League meet the first Seed in Blue Valley and manage destroy it, but it takes too long and by the time it’s over, two more Seeds have landed. While Superman and the Flash try and stop Seed 2 and the Flash and Cyborg try to stop Seed 3, Batman asks if Aquaman can telepathically talk to one of the spores and learn more about the creature. Aquaman isn’t keen on doing so, since the spores are designed to take control over a person’s body, but Hawkgirl says that if Aquaman is taken over, she will kill him, so he agrees. While telepathically linked to one of the spores, Aquaman learns that the only way to stop the invasion is to kill the main source of the spores: the Star Conqueror itself. But the Star Conqueror lives in deep space and won’t move — so Batman has Aquaman connect him to the spore and makes it feel fear. “Now it really, really wants to kill me,” Batman says. “Now that you ticked up a giant space monster so that it comes to Earth, do you happen to have a plan?” Aquaman asks. “Yes,” Batman says. Superman and others return, with John Stewart, Hawkgirl, and a newly recruited Shazam taking their place in fighting the Seeds, which appear to be spawning spore-like monsters in order to kill them. The League, led by Batman, go to the Slab, where each of them talks with their counterpart in the Legion of Doom, to convince them to work with them in order to save the world. 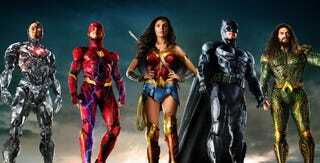 The Flash appeals to Captain Cold’s love for his sister; Wonder Woman appeals to her former friendship with the Cheetah; Batman tells Deathstroke that he will make sure none of his enemies touch Rose, Deathstroke’s illegitimate daughter; Aquaman tells Black Manta that if he helps, he will have his revenge; and Superman tells Lex Luthor that this is his chance to prove he is better than Superman. All of the Legion agree. As the Star Conqueror moves into the galaxy, Batman says that the plan is to meet it when it comes to Earth. Aquaman says that that isn’t possible — the Star Conqueror is huge, the size of a continent. “You could have told me that earlier,” Batman says. “You didn’t ask, Mister ‘I always have a plan,’” Aquaman says. Luckily, Lex and Black Manta built their base of operations — a giant skull ship located in Slaughter Swamp — with secret Kryptonian technology and, with the help of their A.I. Grid, they are able to launch into space in order to stop the Star Conqueror before it even gets to Earth. On Earth, Hawkgirl, Green Lantern, and Shazam are having a hard time fighting the spores individually. Then Shazam has an idea: “Silly me, haven’t been using the Wisdom of Solomon. Did you know that I can give a portion of my powers to people?” As Green Lantern holds him aloft, Shazam yells out “Shazam” over the crowd of spore-controlled people and magical lightning hits them, killing the spores. “Now if only we could do that without me back turning into a small boy,” Billy Batson says. The Star Conqueror slows as it reaches the moon and the Legion’s ship manages to land on it and map a way to its brain, where they will use Captain Cold’s Cold Gun to freeze it. Unfortunately, the internal area of the Star Conqueror provides hazardous and the teams end up separated, with Superman and Lex Luthor alone. Lex says that he say all this coming and knew Superman would ask for his help, just as he knew the Star Conqueror’s internal defenses adapted to each of their abilities — leading to Superman being incapacitated right as they reach its brain. “Don’t worry, Superman,” Lex says. “I’ve always known I was better than you. I can kill this thing and save you at the same time.” He takes out the Cold Gun, which he has converted into a Cold Bomb. “And unlike you, I’m only human. I don’t get to come back from the dead. Still, it’s worth it just to see the look on your face.” He sets off the bomb, freezing the entire brain and himself before it explodes. Superman is ejected into space, where he gets his powers back and quickly helps the others return to the ship as the Star Conqueror begins to dissolve into pieces. On Earth, the spores fall off everyone they have captured, while in space, Superman throws the remaining pieces of the Star Conqueror into the sun. The Legion’s ship lands back in Slaughter Swamp and Batman upholds his end of the deal, telling them that they are free...until the next time they commit a crime. Captain Cold visits his sister in Central City to get a new Cold Gun, the Cheetah retreats back into the swamp, Deathstroke gives Rose’s information to Batman, Black Manta visits the grave of his father, and Grid happily decides to stay with Cyborg. John Stewart tells Hawkgirl that he contacted the rest of the Corps and they told him Thanagar was free, so she can return. She tells him that the only Thanagarian that mattered to her is dead, so she’s rather stay on Earth. The Justice League invite her to be a part of the team and she accepts. Superman also invites Shazam, but he says that he prefers hanging out with people his own age, but also says that Superman can call on him anytime. After settling in to her new place in St. Roche, Louisiana, Shayera meets with John Stewart again and they decide to go on patrol together. She starts to talk about now that Earth has defeated the Star Conqueror, others might try different conquer Earth just for the fame. She mentions the pirate Kanjar Ro, the Appellaxians, and the Reach. “And that’s not even mentioning Apokolips,” she says. “So why don’t you leave?” John says. “Because you saved me and my planet. So when the time comes, I will be here to save yours,” Shayera says.